Climate Change, due to Solar Variability or Greenhouse Gases? Part B. | Watts Up With That? Climate Change, due to Solar Variability or Greenhouse Gases? Part B. In a previous post, Part A here, we discussed the role of oceans, the Earth’s orbit, and human greenhouse gas emissions on climate change. In this post we discuss the impact of solar variability. How does the Earth naturally respond to warmer temperatures? Clearly the Earth has been warming for the past 150 years or so, the warming could be natural or human-caused or both. Will it continue warming until dangerous temperatures are reached? Newell and Dopplick (Newell and Dopplick 1979) and Sud, et al. (Sud, Walker and Lau 1999) have pointed out that evaporation from the oceans limits maximum average atmospheric temperatures to 303K (30°C or 86°F). Evaporation stores latent energy (heat) in water vapor that is released when the water vapor cools and precipitates as liquid water. The water vapor can be transported great distances, often in clouds, before the precipitation occurs and the heat is released. This process of evaporation, convection and precipitation is the primary mechanism for cooling the surface of the Earth according to (Pierrehumbert 2011), (Benestad 2016) and others. Thus, as long as the oceans exist, it is highly unlikely dangerous temperatures will be reached on Earth (Miskolczi 2014). Christopher Scotese has compiled a detailed reconstruction of Earth surface temperatures for the past 550 million years (Scotese 2015). The Earth’s surface average temperature has been as warm as 28°C in the past and as cold as 12°C. The average surface temperature over the last 550 million years is around 20°C (68°F), some 5°C warmer than today. At no time in the Earth’s past do we see average temperatures that exceed 30°C, which agrees with the conclusions of Newell and Dopplick and Sud, et al. Ferenc Miskolczi’s (Miskolczi 2010) analysis of weather balloon data suggests that specific humidity has decreased over the last 60 years which counteracts the effect of increasing CO2 and methane concentrations. Because water vapor is a much stronger greenhouse gas than CO2, a very small change in water vapor concentration can counteract a larger change in carbon dioxide concentration. While Miskolczi’s data was from NOAA, Rasmus Benestad used data from Europe that also suggests that atmospheric water content has dropped 0.018 kg/(m2 decade) over the last several decades (Benestad 2016). Vonder Haar, et al. have also reported that the water vapor concentration in the atmosphere has declined or stayed the same over the past 30-70 years (Vonder Harr, Bytheway and Forsythe 2012). This is at odds with Pierrehumbert’s assertion that if CO2 were to increase the surface temperature, water vapor would increase per the Clausius-Clapeyron relation. The Clausius-Clapeyron relation predicts that specific humidity (total precipitable water) will increase 6-7% per degree of warming and it is a solid relationship in the laboratory. We appear to be witnessing water vapor decreasing or staying the same as CO2 and temperatures increase. Perhaps because precipitation increases faster than evaporation? Or perhaps there are other contravening effects? While statistically significant proof does not exist, Miskolczi and Spencer (Spencer 2010) think the atmosphere compensates for higher temperatures by altering humidity and cloud cover. Lindzen, Chou, and Hou have suggested that cloud cover adjusts to cool the Earth when surface temperatures rise (Lindzen, Chou and Hou 2001). This hypothesis suggests that the major influence on the Earth’s climate is the variation in solar radiation received by the Earth and the distribution of the radiation by latitude. The Earth’s orbit is elliptical, and the Earth is tilted relative to the orbital elliptical plane, these factors vary with time and all affect the amount of radiation the Earth receives from the Sun and where on the Earth it falls. Over the geological short term, meaning a few tens of thousands of years, the average yearly amount of solar radiation striking the Earth doesn’t change much. But, the amount striking a particular latitude does change significantly. Obliquity (the tilt of the Earth’s axis) changes the amount of thermal energy striking the tropics versus the amount striking the poles. This obliquity change is a cumulative and over time the difference between the polar insolation and the equatorial insolation can be very large. This changes the pole-to-equator temperature gradient, which affects climate. Orbital precession (the wobble of the Earth’s axis) changes the amount of radiation striking the Northern Hemisphere in the summer versus the amount striking the Southern Hemisphere in the summer and winter. This is because one hemisphere faces the Sun at perihelion and the other faces the Sun at aphelion during their respective summers. This affects “seasonality” or the difference between summer and winter in each hemisphere. Unlike obliquity, the total amount received in each year at a given latitude does not change, but the timing throughout the year does change and the change is modulated by orbital eccentricity. These orbital effects can radically affect climate, even though the total amount of radiation reaching the Earth, on a yearly average, changes very little. The Earth also reflects sunlight into space and the reflectivity or albedo of the Earth changes with time. Because of all these factors and because the Earth is nearly spherical, while ~1361 W/m2 of radiation reaches the average distance of the Earth from the Sun (one astronomical unit or 1AU) only a global average of ~340 W/ m2 (~25%) enters the Earth’s atmosphere (Kiehl and Trenberth 1997). While we will be discussing yearly averages of solar radiation reaching the Earth at its average distance from the Sun in this section, it is important to realize that the Earth’s orbit is elliptical and that the radiation reaching the Earth varies a lot during a year. The maximum radiation reaches the Earth in January currently and the minimum in July, the annual range is 88 W/m2. See Figure 6. Figure 6. The average radiation reaching the Earth from the Sun, by month. Source (Soon, Connolly and Connolly 2015). Besides the effect of the Earth’s orbit around the Sun, the Sun is a variable star. Solar output and the solar magnetic field vary with time. The solar wind and the solar magnetic field interfere with the Earth’s magnetic field and measures of the Earth’s magnetic field variations (like the “aa-index“) do correlate well with the Earth’s climate (Cliver, Boriakoff and Feynman 1998). Cliver, et al. showed a strong correlation between the minima of the geomagnetic “aa index” and the Earth’s average surface temperature. They also conclude that their data suggests that 50% or more of the global warming since the depths of the Little Ice Age in the 17th century might be due to solar forcing. The aa-index is a measure of the disturbance level of the Earth’s magnetic field based on magnetometer measurements at two stations on opposite sides of the Earth. The two stations have always been in Australia and England. The aa-index is plotted in Figure 7 and it shows a steady increase from 1900 to 1997-2005. After 2005 it drops dramatically and still has not recovered by 2017. The aa-index data was downloaded from the UK Solar System Data Centre. The orange line is the HADCRUT4 temperature anomaly for the same period. The best correlation is between the minima of the aa-index and average temperature. The sudden drops in aa-index after 1997 and 2005 suggests that the solar component of climate change is decreasing (Cliver, Boriakoff and Feynman 1998). The aa-index reflects the character of the solar wind and solar flares as observed near the Earth, it is a function of the solar wind speed, squared and the intensity and direction of the magnetic field. It measures the solar influence on the Earth’s magnetic field. It is interesting that the aa-index is very similar in 2009 to what was calculated for 1902, possible reasons for this are discussed in Feynman and Ruzmaikin in a Journal of Geophysical Research: Space Physics paper (Feynman and Ruzmaikin 2014). Figure 7. Yearly mean aa-index versus HADCRUT global temperature anomalies. Sources: UK Solar System Data Centre, download here. HADCRUT4 data, download here. Cliver, et al. state that it is well established that geomagnetic activity is driven by the solar wind. The aa-index is well correlated to sunspot peaks as shown in Figure 8 (Cliver, Boriakoff and Feynman 1998). The aa-index is a measure of the Earth’s magnetic field, but the correlation to sunspots suggests it is driven by solar activity and not an internal (to the Earth) effect. The aa-index has increased dramatically from 1900 until 1990, or perhaps 2005, and it may not be a coincidence that the first large decrease in 1997 was also the beginning of the pause in warming. There are problems with the aa-index and it should only be used qualitatively (Love 2011). However, although there probably is some long-term bias in the measurement, it is likely that the upward trend in the aa-index lows is real. Figure 8. Plots of the aa-index (red) and annual sunspot number (yellow). Source NOAA here. Besides the solar activity indicators discussed above there are several more, some of these are listed and plotted in Figure 9. The plot is from Joanna Haigh’s report on the “Solar influences on Climate” (Haigh 2011). Aurorae (the Northern Lights) are also a good qualitative indicator of solar activity. These lights are triggered when the Sun emits high energy, ionized particles that are carried to the Earth by the solar wind and interact with the Earth’s atmosphere. The resulting bright aurorae are associated with an electric current in the upper atmosphere that causes disturbances in the Earth’s magnetic field (Haigh 2011). 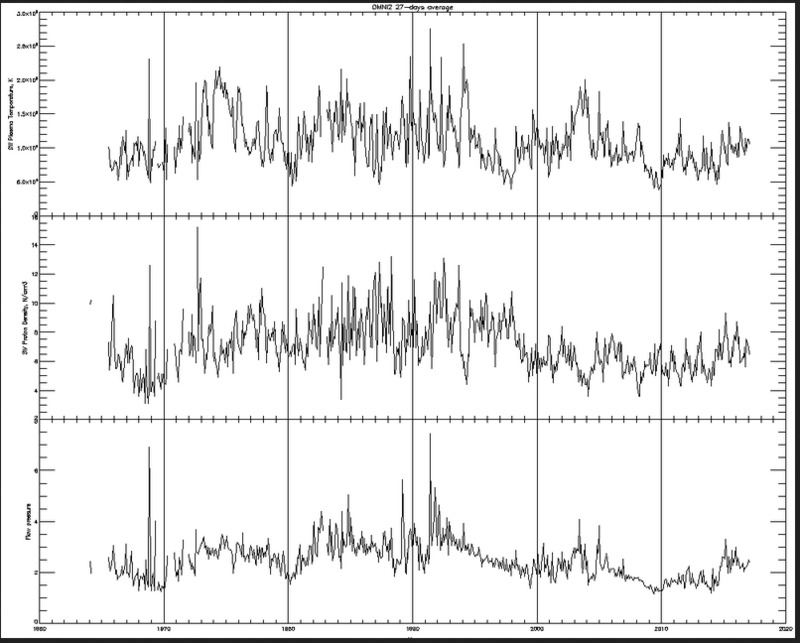 The magnetic disturbances are also seen in the aa-index plotted in Figures 7 and 8. The solar wind and the solar magnetic field help protect the Earth from cosmic rays. Cosmic rays produce neutrons when they strike the atmosphere and the neutron count, measured on the surface since 1950, is a function of the level of cosmic rays entering the atmosphere. A high level of cosmic rays suggests a weaker solar magnetic field, solar wind and lower solar activity. 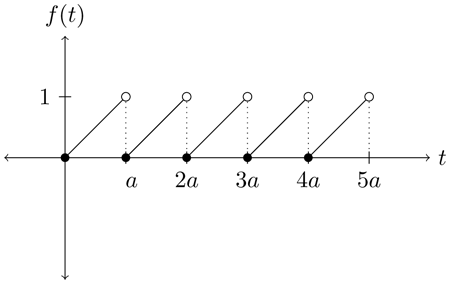 The neutron count rate in Figure 9 is inverted as a result. The isotopes beryllium-10 (10Be) and carbon-14 (14C) are only created in nature by cosmic rays. Humans can create them with atomic bombs, so the records since World War II are tainted, but before 1945, these two isotopes are useful proxies for solar activity. Carbon-14 is recorded worldwide in tree rings. Beryllium-10 is recorded in ice cores through precipitation and has a short lifetime in the atmosphere which makes these records very useful. The scale in Figure 9 is inverted for convenience. Another possibly useful solar proxy is the level of 10.7cm solar radio flux. It has been measured consistently in Canada since 1947. It is a useful solar activity proxy that can be measured under all weather conditions on the surface of the Earth. The 10.7 cm radio flux from the Sun is plotted with the SORCE satellite TSI in Figure 10. Figure 10. The 10.7 solar radio flux and the SORCE satellite TSI from 1947 through 2017. Data sources: TSI here and 10.7 flux here. While the TSI (total solar irradiance) and the 10.7 cm radio flux show the same cycle, the characteristics of the trough and peak appear different. This suggests they are seeing different aspects of the same thing. Generally, this is true of all the solar activity proxies. They see the same solar activity cycles, but they do not agree in detail. Figures 8, 9 and 10 all show this. None of the solar activity proxies are quantitative, including the satellite measurements and the sunspot counts, all are qualitative. The reason is simple, we cannot compute a well-defined measure of solar activity to compare them to. Each proxy roughly correlates to the others and to some aspect of Earth’s climate, but beyond these rough correlations, there is nothing quantitative. Galactic cosmic rays (GCR) anticorrelate with TSI, with a correlation coefficient of -0.68 (R2=0.46), significant at the 99.99% confidence level (Lockwood 2006). But, as you can see from the correlation coefficient it is not a perfect match, they are influenced by multiple different factors. The physics behind this connection as well as the other solar proxies discussed above is far from clear. But, a general qualitative connection between the aa-index (Figure 7), the sunspot count (Figures 8 and 18), and the other solar proxies is apparent. However, exactly how this works is unknown. It is assumed that this connection can be extended into the past by using 10Be and 14C, but since we have little understanding of these proxies, this is just an assumption (Friedhelm Steinhilber, et al. 2012). The solar proxies can be used to estimate TSI (total solar irradiance). Then some researchers and the IPCC assume TSI is the only solar variable that influences our climate (IPCC 2013). This is a logical assumption since the total solar energy the Earth absorbs is obviously important to our climate, but it is an assumption. Other natural factors could also play a significant role in our climate, in particular there is considerable circumstantial evidence that variations in the solar magnetic field and variations in high frequency radiation, such as UV and EUV, play a role in climate and are only loosely related to variations in TSI (Lockwood 2006) (Floyd, Tobiska and Cebula 2002). The current emphasis on TSI, ignores evidence that the climate impact of variations in the shorter solar wavelengths, for example UV wavelengths, are different than the longer wavelengths. We have also seen that the solar output of longer wavelengths varies less than the output in the shorter and more energetic wavelengths (Woods and Rottman 2002). Another key issue is the difficulty in measuring TSI accurately. Figure 11 shows the recent attempts to measure TSI by satellite. Figure 11. Plots of the (a) original satellite measurements of TSI, corrected to 1AU, and (b) one of the spliced composites made from the raw data. Source (Haigh 2011). Further, no satellite has functioned for two cycles, so there are no consistent measurements of the TSI baseline. The PMOD composite in the lower part of Figure 11 shows a declining baseline. Scafetta and Willson’s “ACRIM”composite shown in Figure 12 shows an increasing baseline TSI (Scafetta and Willson 2014). A debate has raged for many years about the TSI baseline, is it increasing, decreasing or flat? Bottom line is we don’t have a clue and will not until the satellite instrumentation becomes more accurate and stable. The new Total and Spectral Solar Irradiance Sensor (TSIS-1) instrument on the International Space Station became operational in March, 2018 and it is recoverable, so the calibration can be checked after it is used and that may help resolve this issue. But, currently we must accept that we do not know if the Sun is varying in a longer-term (longer than the basic ~11-year Schwabe Cycle) way or not. Since the raw data (corrected to 1 AU, the average distance between the Sun and the Earth) spans a total interval of 13 W/m2 and the baselines span 10 W/m2 we really don’t know how much solar radiation reaches the Earth with any degree of accuracy. As described above, 10 W/m2 reaching the top of the Earth’s atmosphere, translates to a global average of 2.5 W/m2 after considering the Earth is approximately a sphere. This error is larger than the IPCC estimate of radiative forcing due to CO2 of 1.68 W/m2 (IPCC 2013, 13). As discussed above, TSI, and the variation in TSI, is obviously important to our climate, but it has not been shown that it is the only solar variation that is important. Figure 13 is a plot of the aa-index and the SORCE satellite TSI. It suggests the baseline should be increasing, at least through 1990 or so. Figure 13. Plot of the aa-index and TSI. Data sources: TSI here, aa-index here. The peaks in the number of sunspots appears to show an increase until 1960 or so and then decrease as shown in Figure 14. Thus, the sunspot record supports the PMOD composite trend and the aa-index supports the ACRIM composite trend. The sunspot number minima have no clear pattern, unlike the minima in the aa-index, this suggests there is little information in the sunspot minima. Figure 14: A plot of the SILSO sunspot number versus SORCE TSI. As Figure 10 shows, the 10.7 cm radio flux also supports the PMOD composite trend. The 10.7 cm radio flux (abbreviated F10.7) correlates well with sunspots if solar activity is high, the relationship breaks down when solar activity is low (Svalgaard and Hudson 2010). The F10.7 flux originates in the coronal plasma high in the solar atmosphere. In Figure 15 we plot a TSI reconstruction by Greg Kopp (Kopp 2018), using a code and methodology written by Coddington (Coddington, et al. 2016) and another TSI reconstruction based on an interpretation by Egorova, et al. in press in Astronomy and Astrophysics in 2018 (Egorova, et al. in press) which is an update to (Shapiro, et al. 2011). Dr. Tatiana Egorova’s reconstruction specifically addresses some criticisms of the Shapiro, et al. reconstruction. These two reconstructions are representative of the extremes of TSI reconstructions produced from sunspot records. Figure 15 compares the two reconstructions to the HADCRUT4 global temperature anomaly and Figure 16 compares the reconstructions to the aa-index. Figure 15. The Coddington/Kopp TSI reconstruction and the Egorova, et al. reconstruction compared to the HADCRUT4 global temperature anomaly. Coddington/Kopp data is here, the Egorova, et al. data is from Dr. Tatiana Egorova, Physikalisch-Meteorologisches Observatorium Davos World Radiation Center, and the HADCRUT4 data is from here. TSI reconstructions like the Coddington/Kopp and Egorova, et al. reconstructions shown in Figures 15 and 16, that go back into the pre-satellite era, must rely on proxies of solar activity. We have already discussed the aa-index, sunspot numbers, the 10.7 cm radio flux, neutron counts, aurorae, and the cosmogenic isotopes 10Be and 14C. In addition, there are other measures, related to sunspots that are important. These include the solar equatorial rotation rate, the structure of the sunspots, the sunspot decay rate, and the number of sunspots without umbrae (Hoyt and Schatten 1993). Three important solar proxies allow solar activity to be modeled back to the mid-1700s, the length of the solar cycle, the decay rate of the solar cycle and the mean level of solar activity. It is important to recognize that these proxies are not perfect indicators of solar activity or TSI and that only 50% of the solar variance is modeled. Further, we must realize that although it is obvious that TSI influences our climate we don’t know how much of climate change is influenced by TSI and related factors. Figure 16. The Coddington/Kopp TSI reconstruction and the Egorova, et al. (2018) reconstruction compared to the UK Solar System Data Centre aa-index. In Figure 16 we plot the aa-index in gray, it compares much better with the Egorova, et al. TSI reconstruction than the Coddington/Kopp reconstruction. In Figure 15 we see that the HADCRUT4 global temperature anomaly also compares better with the Egorova, et al. reconstruction. These are only two of many TSI reconstructions that have been developed in recent years. But as Soon, Connolly, and Connolly noted in their Earth Science Reviews paper in 2015 (Soon, Connolly and Connolly 2015), all the various TSI reconstructions fall into two large groups, the high solar variability group, like Egorova, et al. and the low solar variability group like Coddington/Kopp. For more examples of reconstructions in each group and a discussion of them I refer you to their paper. We also do not know enough about how TSI affects climate over other factors, nor do we know enough about how TSI varies as a function of sunspot records. That really hits the nail on the head. Qualitatively, the indicators of solar activity follow the same pattern, the pattern of solar change is undisputed. The magnitude of the change and the magnitude of impact on Earth’s climate are unknown. Sunspot statistics help us show a pattern of solar activity, they do not help us determine the absolute magnitude of long term variations in solar activity. To get at that longer-term trend we need to make assumptions, if we make the assumptions Shapiro, et al. made we get a highly variable Sun, if we make the assumptions Coddington made, we get a quiet Sun. No one can know which is correct, our current TSI records are too imprecise and too short. By comparing the aa-index with the sunspot record we can see a distinct solar minimum at 1902, followed by one that occurs between 1997 and 2006, with the lowest point (so far) at 2008-2009. Feynman and Ruzmaikin call this the Centennial Gleissberg Cycle (Feynman and Ruzmaikin 2014). Whether or not this is the cycle Gleissberg described is controversial, so we will simply call it the Centennial Cycle. While the name “Gleissberg” is used for a number of potential solar cycles, a centennial cycle of about 104-106 years is apparent in 10Be and 14C records, see Javier here, (McCracken, et al. 2013) and (Feynman and Ruzmaikin 2014). Figure 17 shows the past 150 years of sunspot and aa-index records and they seem to show a cycle of this length. Besides the cosmogenic isotope record there is other evidence for the Solar Centennial Cycle as discussed in Feynman and Ruzmaikin (2014). Figure 17. The SILSO sunspot record and the UK Solar System Data Centre aa-index (see here) showing the ~1900 extended solar minimum and the ~2000 extended solar minimum. The presence and persistence of the cycle or oscillation is debated, as it does not always have a strong signature. The Centennial Cycle is persistent but has reduced amplitude in periods without grand minima. It is interesting that the sunspot peaks increase to about 1960 and the sunspot minima are always near zero and have no distinct trend. The aa-index provides more detail in the solar activity lows and the lows in the aa-index increase (except one) until 1990 and then fall dramatically until 2006-2009. The HADCRUT4 temperatures increase from 1960 to 1997 and, except for a large El Nino in 1998 and again in 2016 they are flat, to slightly increasing. Thus, the aa-index might be giving us more climate information than the sunspot record. I have not read an explanation for the anomaly in both records between 1960 and 1979, but this was a cold period in the Northern Hemisphere (see Figure 7). It is clear that sunspot lows contain little information because the solar cycle did not stop, and the modulation potential did not fall to zero during the Maunder minimum (Shapiro, et al. 2011) when there were very few sunspots, see Figures 9 and 18. 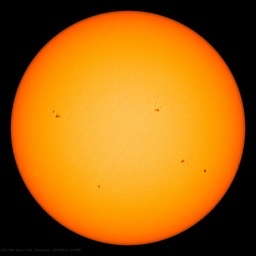 It appears that sunspots do not form below some lower limit of solar activity. They may not form at all below a local solar magnetic field strength of 1,500 Gauss (Penn and Livingston 2006) (Soon, Connolly and Connolly 2015). Figure 18 shows the group sunspot number in red during the Maunder Minimum. It also shows the solar magnetic field modulation parameter (ɸ) from 14C (yellow), 10Be (cyan), and a model of solar flux in green. The black line is the mean of a composite solar modulation parameter for each solar cycle. As you can see sunspots are essentially flat-lined from 1645 to 1700, but the modulation measures are active and greater than zero (Lockwood, Owens, et al. 2011). There is considerable solar variability during the Maunder Minimum. Figure 18. The Maunder Minimum group sunspot number (red, RG), a composite solar modulation parameter (ɸS) in black, and the modulation parameter from 14C in yellow, 10Be in yan, and a model of solar flux in green. The gray bars are even numbered Schwabe cycles that are numbered at the top of the figure. Source (Lockwood, Owens, et al. 2011). I’ve tried to provide a brief overview of the actual data used to support the poorly defined anthropogenic “greenhouse gas effect” hypothesis in part A and the natural climate change due to solar variability hypothesis in this post. There has been a great deal of debate about natural (mostly solar) influence on our climate versus human influence. The key point of this article is that it is likely that both solar variability (including orbital effects) and humans affect the climate. Other major plants and animals, like trees and phytoplankton, have some influence as well. Depending upon the time frame being discussed it is also likely that ocean circulation affects the climate on scales of several years (ENSO) to over a thousand years (the thermohaline circulation, tidal effects, and ocean CO2 uptake). It is not clear which of these influences is the largest, we all have an opinion, but there is no quantitative data to support the idea that any of them are dominant. The Sun is a variable star but measuring the amount of variation and its effect on climate eludes us, especially in the longer term. Multiple proxies confirm this, although some solar proxies appear to vary in phase with climate proxies, we don’t really know much more than that. These are all proxies and hypothetical mechanisms that provide cause-and-effect between the Sun’s variability and climate abound, but none are quantitative or have been proven by making predictions that are later verified. 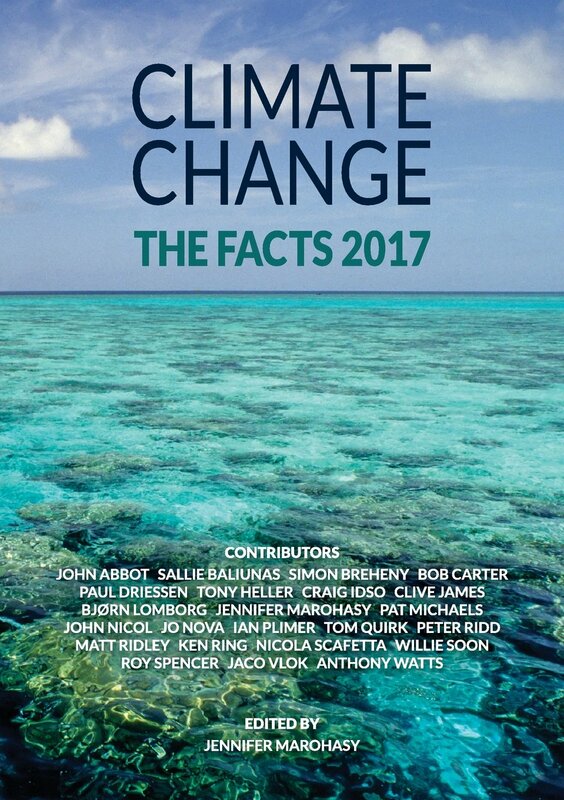 Since the modeled difference between “natural” climate change and observations of global mean temperature are used to compute human influence, the uncertainty in the magnitude of solar and other natural climate change casts considerable doubt on the claimed magnitude of human influence on the climate. The long and short of it is, we can be reasonably certain that human greenhouse emissions affect climate, but we don’t know by how much. We can also be reasonably certain that solar variability affects climate, but we don’t know by how much. We know that most thermal energy is absorbed by the oceans and that it redistributes this energy around the Earth, but we don’t know how much or how fast. The debate over the cause of climate change is fierce for the simple reason that we don’t know very much about it. There is a reasonable chance that we will enter a solar activity minimum comparable to the Maunder Minimum soon (Lockwood, Owens, et al. 2011), and if this occurs it will be an opportunity to evaluate the solar effect on our climate. Usoskin, et al. defined a grand solar minimum as a period when the smoothed sunspot number is less than 15 for two or more consecutive decades (Usoskin, Solanki and Kovaltsov 2007). Previous periods that contain clusters of grand solar minima are 8,300BP to 7,100BP (1,200 years), 6,300BP to 4,700BP (1,600 years), and 3,300BP to 2,200BP (1,100 years). The current period began about 1,040BP and could well go on for another 100 years or more. If the solar effect can be quantified, we will be able to estimate the total effect of the oceans, humans and other plants and animals. From this composite measure we may be able to eventually extract the human impact. But, for now, we simply do not know what it is. As my friend Javier says, debate, arguments and disagreements fuel science. Let the debate continue but remember to disagree in an agreeable fashion. We will get to the truth quicker and healthier that way. If I disagree with you, it isn’t personal, I just disagree. Science is easier if you don’t “marry your opinions” and you carefully separate what you know from what you don’t know. Do some research, write a post explaining why you are correct, and we will respond. This is how science is supposed to work, unless you are Michael Mann or the city of San Francisco, then you sue anyone who disagrees with you. The bibliography can be downloaded here. The data used to make many of the figures in this post can be downloaded here. 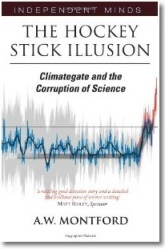 Andy May has just published his first book: “Climate Catastrophe! Science or Science Fiction?” It is available from Amazon.com and barnesandnoble.com. Javier provided many helpful comments on this post. May 3, 2018 in Climate News, Solar. 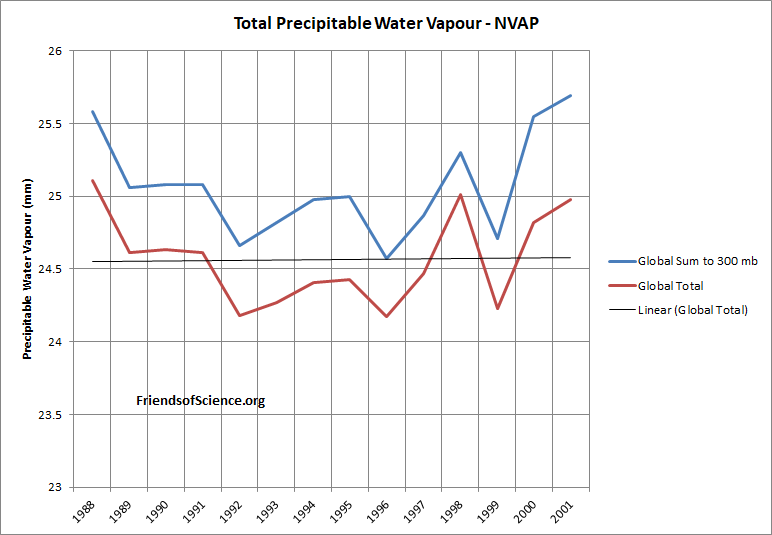 Does IPCC Practice Willful Blindness of Water Vapor to Prove a Scientific Point for a Political Agenda? I think “highly unlikely” is a vast understatement. The Earth has had 4 billion years or so of opportunity, under wildly varying atmospheric compositions, yet thermal runaway has never occurred. Q: What’s so special about right now? A: Nothing. So the claim is that average global temperatures of up to 30°C are not dangerous. That’s around 15°C warmer than current temperatures. I’d like to know what definition of “dangerous” is being used here. As I have understood it 30°C isn’t the average global but the maximum sea surface temperature. The exact words were “average atmospheric temperatures”. In any event it’s difficult to see how sea surface temperatures could be warmer than land temperatures. Bellman, the post says “maximum average atmospheric temperatures.” And that is a true maximum average. Locally, especially over land, temperatures can get higher than that, but not a global average. In the past the average global temperatures have varied from 12C to 28C over the past 550 million years. The average is around 20C, some 5C higher than today. Dangerous is much higher than 30. 30 is a very common summer time temperature everywhere in the world. As I said, 30°C will be 15°C higher than today. I don’t think youv’e grasped the idea of an average temperature. If the average global temperature is 30°C, then that “very common summer temperature” will be the average across the world,averaged over day and night. If the average temperature is 30°C, 15°C warmer than today, then on average everywhere is 15° warmer, those common summer temperatures of 30° turn into dangerous highs of 45°C. But those high temperatures have not been seen in 50 million years. All the time humans have existed, and certainly all of human civilization have been much colder. And, if the argument is that life survived on earth at 30°C temperatures, so it cannot be dangerous, would you apply that logic to ice ages? There are many who would argue even a return to the temperatures of the little ice age is dangerous. Bellman, Well, dangerous is a vague word. But, when the average temperature of world has risen to >25C, it becomes more uniform with a lower pole to equator gradient. The equatorial temperature barely changes, but the poles warm a lot. Palm trees and crocodiles near the poles for example. It does not seem to be dangerous. Humans evolved during this ice age for sure, but we can adapt to warmer temperatures, we now live all over the world. Without fossil fuels it would be much tougher. Prosperous people, with electricity and cars, adapt quicker. And if that was not enough, there’s this little bit of de-smoothed and de-filled dynamite. A very interesting post, suggesting Earth was warmer in the 1930’s than today. I posted this analysis in mid-2008 during a cold period. I used Hadcrut3 to 1979 and then UAH LT temperatures from 1979 on. It shows no net warming from 1940 to mid-2008. Sometimes, the only thing that can be concluded is that we don’t bleeping know what the causes are. But thinking like that will get you kicked out of any “consensus” on global warming papers, like the 67% that were excluded from the Cook et al study. Should that atmospheric moisture change be in units of kg/m3 decade? Phil Rae, No, Benestad’s units are kg/(m^2 decade), translation: A square-meter column of air to the top of atmosphere contains 29 kg of water vapor on average. Lots of researchers use units like this, some even define what they mean by the top of the atmosphere. Thanks for your prompt reply, Andy! I’ve learned a lot already reading your posts and the ongoing debate with other contributors here and this is one more piece of knowledge to add to my imperfect repository. Thanks again, Andy…much appreciated. Phil Rae, thanks for the comment, but “none” is plural in this case isn’t it? I think here it is translated best as “none of these.” It still looks correct to me, but I would like to hear other opinions. “None” in this sentence can mean either “not one” or “not any” so “none” can take either a singular or plural verb. If you meant to emphasize that “not one of the proxies is quantitative” then it would be proper to use the verb “is”, but if you meant “not any of these proxies are quantitative” then the proper verb to use is “are”. See (http://www.onlinegrammar.com.au/top-10-grammar-myths-none-always-takes-a-singular-verb/) – author’s choice. Andy & Don…..Ooops! I stand corrected! Blame my English teacher from fifty years ago! I’ve used the singular verb with “none” ever since. Another new non climate-related thing for me to learn here at WUWT! Thanks, guys! Just the usual stuff from the unreliable sources. The old Cliver paper you start with has long been falsified [on two fronts: the recent temperatures have not followed the aa-index and the index was wrongly calibrated before 1957]. Leif, I assume you mean the aa-index from 2005 or so. I do not think we have enough time or information to invalidate the aa-index to AMST (annual mean surface temperature) correlation based on 12 years. I do not agree that Cliver, et al. has been invalidated. However, that said, certainly there are some problems with the aa-index proxy, are they more serious than the problems with the other solar proxies? I’m not sure, the problem is we don’t know how good any of them are and we won’t for another 20 to 50 years. In 50 years time, maybe all of them will be invalidated. Love, 2011 stated “it is probably best to regard the aa-index as a qualitative measure” which was my conclusion as well. But, all of the proxies, including sunspot records and the TSI satellite measurements to date are qualitative. We have no idea which is a better measure of the solar variability effect on Earth’s climate. Solar irradiance is Earth’s primary energy input. It establishes the thermal and dynamical structure of the terrestrial environment and is the primary external cause of terrestrial variability. Does anyone question this assertion from Judith Lean? Bob Weber, I agree with Lean’s statement as a matter of personal opinion. But, I acknowledge that we do not have definitive data to prove that assertion. Lots of data points that way, but it’s not very quantitative yet. Would you mind being a little more specific? When you say “has long been falsified,” do you mean that there was a single critical response, or that the paper has been withdrawn? It is not unusual for someone to have complaints about a paper. That is the essence of post-publication peer review. Often those complaints themselves have issues. Also, would you mind defining “recent temperatures.” Lastly, what was the nature of the calibration issue? Did it impact the aa-index minima, which is the critical issue as laid out by May? Leif’s analysis is expanded in Love, 2011. Both describe real problems with the aa-index, how serious the problems are is a matter of debate. All of the proxies have some problems, some are known and some are not. Clausius-Clapeyron equation relates latent heat to volume change. It says nothing about specific humidity for any condition other than saturation. That is, it says nothing about specific humidity under typical clear sky conditions. Perhaps I should have said something like, “Computer models use the Clausius–Clapeyron relationship to compute a 5% increase in TPW (total precipitable water) for a 1 degree increase in temperature.” It’s true that CC doesn’t result in a value for TPW, but that is the way GCM’s (Global Climate Models) compute the value. It is an oversimplification. The data is graphed at Figure 3 in my blog/analysis. Rational extrapolation looks like 8% increase since 1960. This added ghg is countering the cooling that would otherwise be occurring. The WV increase must eventually stop and might have stopped already. 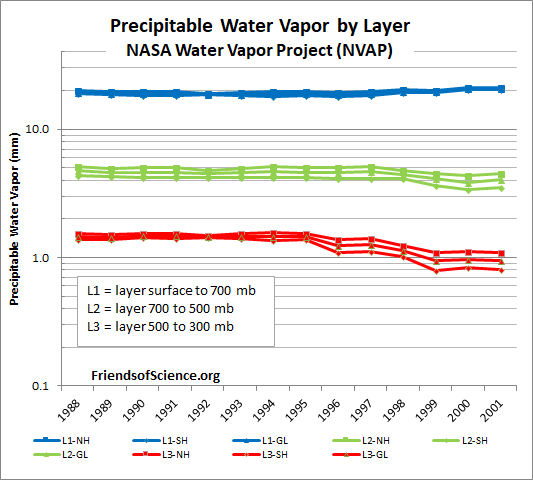 Andy – I am familiar with that graph which was presented at https://wattsupwiththat.com/2013/03/06/nasa-satellite-data-shows-a-decline-in-water-vapor . Also however, Table 1 at that site shows an INCREASE of 1.19% per decade for the sum. Perhaps the log scale on the graph deceives the eye. Also, there is quite a bit of variation in the data and the graph ends several years ago. The NASA/RSS data is through March, 2018. Dan Pangburn, Here is a linear plot of the NVAP data. Technically you are correct, it does go up, but I doubt it is significant. Dan Pangburn, I’m skeptical of any satellite data measurements of water vapor and would always take weather balloon data over satellite. As for recent NVAP data, I can’t find anything newer than what I’ve shown, if anyone knows where to get it in a reasonable format, let me know. Or show a plot of recent years. I suspect that the analyses done by Miskolczi and Benestad are pretty reliable. I presented an equation to precipitable water [Indian J. Met. Hydrol. Geophys. (1976), 27 (2): 163-166, titled “Simple formula for the estimation of wet bulb temperature and precipitable water]. The precipitable water is a function of square of wetbulb temperature and using this formulae estimated wetbulb temperature distribution over India was presented in another paper [27(2):167-171]. Thank you Andy, for the interesting article. It is indeed interesting that the total vapor content has been increasing for the since 1995, but I don’t know the significance of it. From my point of view the decreasing vapor concentration in the top of the atmosphere will inevitably reduce the emission altitude, independently of any increase in vapor content on the lower troposphere. I see this as a strong indicative of negative feedback. Love how Egorova’s proxy guesstimate of TSI miraculously begins to track modern instruments just in time to avoid ‘falsification’. What do you make of that Andy, does it seem a bit too-cute to you, also? What credence do you give to it, given you’ve chosen to include it for some spice? WXcycles, Here is Dr. Tatiana Egorova’s comparison to the PMOD composite. Her reconstruction is labeled CHRONOS. She also compares the results from two other models, SATIRE (Yeo, et al.) and NRLSSI2 (Coddington, 2016). The comparison is close, (b) shows the residuals. It is not surprising that her model matches satellite measurements well, it is based upon them. I neither believe it or disbelieve it, it is a valid model with the data we have, but we need 20-50 years more data to know if it is the best model or not. We don’t even have anything to compare a model to yet. We don’t know the ground truth. According to the paper “The Green House Effect at the Molecular Level” by Michael Monce , CO2 is not a significant greenhouse gas compared to the H2O. molecule. You can google and download this paper. He determines this using Quantum Physics and comparing the heat effect of the H2O molecule to the CO2 molecule by integrating absorption spectra over each molecule. He concludes that the H2O molecule is 10^17 more of a greenhouse gas than the CO2 molecule. Could someone evaluate the validity of this paper, If true it would destroy the CO2 AGW hypotheis. I went to Connecticut College and did not see any indication that it has been withdrawn, only that it his opinion of Michael Monce ..It has been up there since 2013. Thank You (!) for this summary of solar variability and possible relationships to Earth climate. We can be certain of one thing from this: The uncertainties far outweigh the certainties, in our current understanding of Earth’s climate(s), the variables that modulate climate, and interactions thereof. How does the Earth naturally respond to warmer temperatures? A good summary section. Water vapor is driven by the solar cycle influence via variable sunlight driven subsurface OHC. The indice that responds the most to solar cycle insolation-TSI is OHC, and the others follow. Each individual plot is 12 years across, roughly a solar cycle. 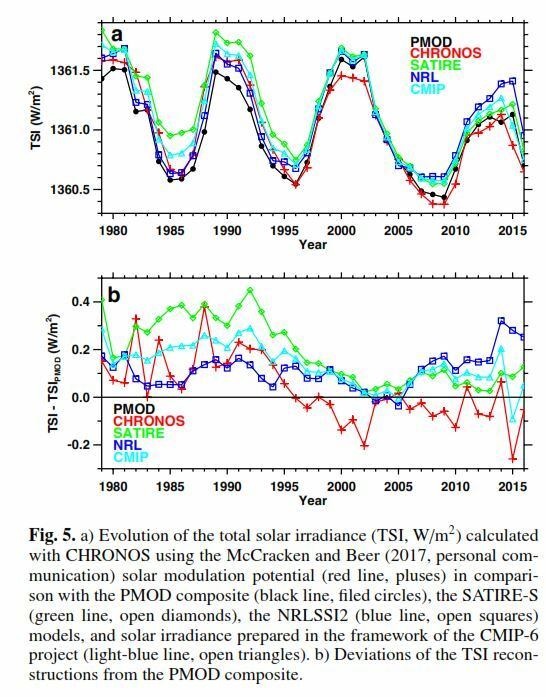 The TSI data covers 4 solar cycles, the solar flux and SSN go back further. Bob Weber, great panel of plots! Is “RSS WV” the RSS total precipitable water? If so, it is showing a decline over the 144 months. Precipitation looks very flat. Everything correlates well with the solar cycle as you say. Really nice display, have you published this? Or do you plan to? Thank you for noticing. Yes. It’s in my research summary poster and I intend to discuss it here in an article. I was advised by more than one experienced scientist at the recent LASP sun-climate symposium to both keep talking about it and to break it all down into several papers for publishing. I’ve actually gotten an invitation from a publisher but it’s not the right one. It could take a year or more to finish all that. What I’m also working on is setting up an online observation post to monitor the progress of the next solar cycle in terms of these parameters. Sorry, that link was for February, no good now. Here’s March/a>, link good until May data is out. The decline in WV though to the cycle end is the secret to understanding how low TSI at solar minimum creates clearer skies and worsening drought conditions via low evaporation. The first spike in the WV plot is from the ‘solar cycle onset’ ENSO, like 97/98, 09/10. The next broader rise is from the solar maximum years of higher TSI levels. It appears that water vapor increases with sunspots. Shouldn’t this mean the greenhouse effect should then drive up temperatures? This should be the same positive feedback that supposedly drives up temperatures with CO2 increases. Willis cannot find any data the shows a correlation between solar cycles and temperature. He uses that to question solar effects on temperature but, in light of this data, doesn’t that also mean that water vapor feedback is in question? Your figure 12 can be updated from here. Bob Weber, Thanks! Great plot, showing the differences and problems. Eqn 1 at http://globalclimatedrivers2.blogspot.com produces a match with measured temperatures 1895-2017 (Table 1) of 98.3% (2017 update). (Admittedly the simple approximation of ocean cycles and selection of Savg in Eqn 1 is ‘curve matching’ but the rest, not so much and IMO a valid format. The three important factors are identified and, at least roughly, quantified). The influence of any unspecified factors is masked by the specified factors and/or included in the residual 1.7%. Dan you’ve always been right whether fully expressed, which is very hard. The oceans & WV are solar driven. Bob, I have been unable to find what drives ocean cycles. How are they solar driven? Felix, thanks for the link although it appears they are connecting ocean cycles to climate. Because there is also a connection between solar activity and climate it follows that ocean cycles and solar activity should correlate with each other but that would be indirect. Ocean cycle periods are about 64 years. I discussed a few studies in an early paper now available at http://journals.sagepub.com/doi/pdf/10.1260/0958-305X.25.8.1455 (before I became convinced CO2 has no significant effect on climate) which indicate that ocean cycles “vary in magnitude and period”. Solar effects on the air also affect oceanic circulation, by expanding and contracting the atmosphere and producing ozone, with predictable effects on pressure, precipitation and winds. As you know, ENSO oscillations depend upon the strength or weakness of the trade winds. Might not be convincing for you, since it’s about a model simulation, but validated by observations. Dan, I’ve been talking about this here above and below in other comments. Look for Fig 18 above and 17 below. I’ll be along as soon as I can with a full article. It’s all very simple. Thanks Dan, I skimmed the article. Lots of meat there. What dataset did you use for total water vapor? I still think water vapor is either decreasing or flat. But, I can believe the strong correlation with sunspots and ocean cycles. Ok, just checking. I have the RSS data. Not sure I believe it, but I have it. Is there any record of solar output at different wavelengths other than SORCE? One reason the IPCC ‘eliminated’ the sun as a possible cause for late 20th century warming was the very small changes observed in TSI. The relatively short time frame of the SORCE data already shows that output at different wavelengths does not change in lockstep with TSI, so that there could have been significant increases in activity at wavelengths that pass through the atmosphere balanced by decreases elsewhere in the spectrum. The fundamental reason they reject the sun is from failing to appreciate the very small changes in daily 1au TSI, the real variation in solar power, are only causing very small daily changes in ocean temperatures, but which lead to the longer term accumulation or depletion to greater temperature changes over time. Consider the above example, the most recent solar maximum as one of the four solar cycles featured in the cross correlation plots from my Fig 18 posted above. The ENSO is influenced not only by the TSI, but also by the meridian jetstream over the Pacific and the Atlantic. This happens when solar activity decreases. 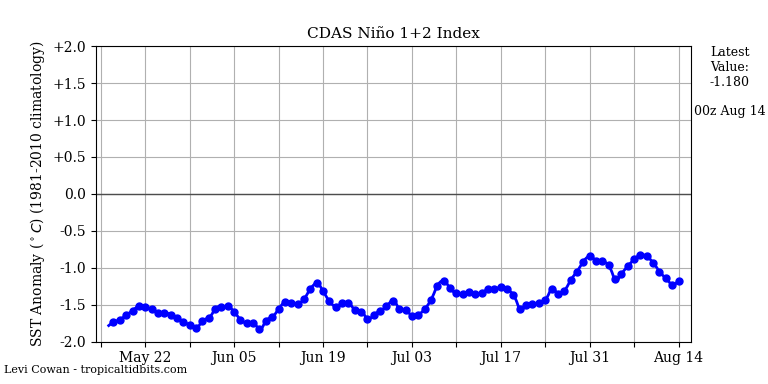 Therefore, the weak La Niña can significantly prolong during the solar minimum. Isn’t increased atmospheric water vapor the positive feedback in the AGW theory? How can atmospheric water vapor be declining with increasing CO2, and the “theory” be valid? Guess they’ll have to change their story again. This assumption that water vapor will increase as CO2 increases is one of the weakest parts of the AGW theory. It probably isn’t happening. matt, that is another one of the questions you are not supposed to ask. The Sun consists of 99.8-9% of the mass of the Solar system. The mass of the human race has more zero,s in front of it than the attack on Pearl Harbour. It’s hot in summer and cold in winter. It’s warm in the day and cold at night. And CO2 is 0.04% of Earth’s atmosphere and around one percent of its greenhouse gases at the surface over most of the planet, where the far and away most important GHG H2O measures some four percent of the air. Many things that happen at the molecular level are not guided by amount. A single molecule of diphteria toxin, ricin, or Pseudomonas enterotoxin, can kill a cell, so you only need ~ 0.1 μg of toxin per kg of body weight to die. That is a lot less than 0.04%. That yearly aa flux graph reads like a book to me. I can readily draw correlations between it, and aspects of the climate system. Looks to me like a Centennial cycle effect on the aa index centennial record could better be thought of as a sawtooth function. Most people are used to global average temperatures expressed as anomalies relative to a reference period and don’t realize that the best estimates of global average temperature vary on a seasonal basis by almost 4 degrees Celsius with a peak in July and a minimum in January, in sync with the northern hemisphere seasons. I find it interesting that the estimated global temperature average varies seasonally in total opposition to the 88 w/m2 variation in solar radiation reaching the earth, with highest average temperature when solar radiation reaching the earth is lowest and lowest average temperature when solar radiation reaching the earth is highest. Here is Figure 2 from above. CFSR estimate of global average temperature by month. Obviously the solar radiation reaching the earth is countered by land/ocean/ice-snow effects that result in a pattern opposite to what would be expected by looking at solar radiation only. I find it interesting that the estimated global temperature average varies seasonally in total opposition to the 88 w/m2 variation in solar radiation reaching the earth, with highest average temperature when solar radiation reaching the earth is lowest and lowest average temperature when solar radiation reaching the earth is highest. As do I. There are only a few days a year, twice, when this TOA large swing is remotely close to the 1au TSI maximum variation, so how is it I can find evidence for 1au TSI forcing throughout the year and no January signature of this huge peak every year? This may be interesting, but I don’t find anything illogical in it. 1. You show that Nino 3.4 peaks around the end of April. This would be a normal lag from the period of maximum irradiation. So this is consistent with the a maximum solar radiation being in January. 2. 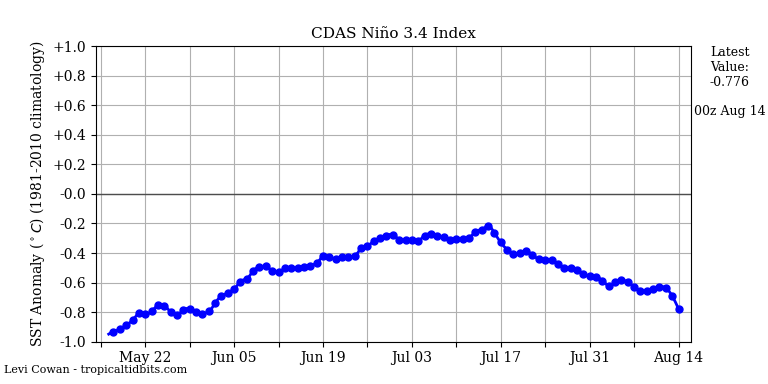 Other commenters on this site (Javier I believe) state that they have proof of a 4 month lag between Nino 3.4 and global temperatures. Thus a maximum in global temps in August would be consistent with a maximum Nino 3.4 in April and a maximum solar radiation in January. 3. Most of the earth’s land is the Northern Hemisphere. Land temperatures are much more responsive to solar radiation than are oceans. Therefore it is quite normal that earth global temperatures will be higher in the northern hemisphere summer. This is an effect of the earth’s revolution. Nothing do do with the the variation in solar radiation. This short analysis points out the foolishness of trying to make direct correlations between cause and effect without considering the physics of the situation. This is the same error that the ‘warmists’ are constantly making. The effect is there, it’s just not the only annual signal. If the Earth’s orbit was circular (no annual TSI variation), then you would expect the SST in the Tropics to show two peaks per year, shortly after the maximum heating due to the spring and autumn equinoxes. The spring Equinox occurs after the relatively high TSI of Jan-March, so that is when the it occurs, so too does the warmest tropical temperatures. The fall equinox is preceded by relatively low TSI from July to September, so instead of a peak there is the continued decline. You have to allow for the effect of the orbital speed which changes in opposition to the change in irradiation. That’s a lot of cloud. Look at the Rossby wave patterns in both hemispheres. The surface temperature reflects both actual TSI and accumulated heat in the continental crust. The accumulated heat can explain approximately 85% of long-period climate changes. There is the time shift between TSI and climate changes due to the integration of anomalous TSI in the rocks. The “half life” of the heat accumulation is approximately 270 years, which means that the surface temperature reflects first of all anomalously high solar activity during such long time. For Bob and Javier and others who ignore the role of the geo magnetic field’s role in the climate. It is a question. We have no clear evidence. In the absence of such evidence you choose to believe and I choose not, because in the absence of evidence I am a skeptic. The relationship between climatic parameters and the Earth’s magnetic field has been reported by many authors. However, the absence of a feasible mechanism accounting for this relationship has impeded progress in this research field. Based on the instrumental observations, we reveal the spatiotemporal relationship between the key structures in the geomagnetic field, surface air temperature and pressure fields, ozone, and the specific humidity near the tropopause. As one of the probable explanations of these correlations, we suggest the following chain of the causal relations: (1) modulation of the intensity and penetration depth of energetic particles (galactic cosmic rays (GCRs)) in the Earth’s atmosphere by the geomagnetic field; (2) the distortion of the ozone density near the tropopause under the action of GCRs; (3) the change in temperature near the tropopause due to the high absorbing capacity of ozone; (4) the adjustment of the extra-tropical upper tropospheric static stability and, consequently, specific humidity, to the modified tropopause temperature; and (5) the change in the surface air temperature due to the increase/decrease of the water vapor greenhouse effect. and the Far East region – during the last millennium. (about 2000 km or 18◦ of a great circle during the millennium). and may result in strong regional effects. et al., 2002; Haigh, Lockwood and Giampapa, 2005). long-term studies of solar-terrestrial relations. The order of things starts with solar energy output, TSI, as Judith Lean said. The geomagnetic cutoff rigidity plot did not resemble the temperature distribution in NA today. It’s wrong to claim that. Knowing it’s true place is not ‘ignoring’ it. The problem here is understanding the aa-index as a measure of the geomagnetic strength and the many other indices like it driven by the solar wind, is typically co-varying with the sun’s magnetic field energy roughly with TSI through solar cycles. The misattribution of warming to the aa-index is owed to TSI. Nothing can or will change that. During the last cold AMO phase it wasn’t, and going by proxies it wasn’t co-varying with sunspot cycles during the previous cold AMO phase either. Not so, where the solar wind is completely out of phase with TSI e.g. at sunspot maximum around 1969 and 1980, one can see which dominates. Increased negative NAO and El Nino conditions means that the low solar wind is dominating over the higher TSI. Failing to offer or provide some evidence about a correlation and a synchronicity between the Sun’s variation and the RF variation, in all possible ways imaginable in the regard of Sun’s variation, renders ones claims as invalid, by default, when the Sun’s variation considered as with some kind of effect or affect in climate. It actually is and stands as simple as that….the rest has and holds no much value. You mean like your point. Variations on different time scales are evident in the final low-noise cosmic radiation (radionuclide production) record (Fig. 3 B, C, and D). A comparison with changes in the geomagnetic dipole field strength (21) (Fig. 3A) shows that the geomagnetic dipole shielding is the main cause of the observed multimillennial variability; the stronger the geomagnetic field, the lower is the cosmic radiation. On multidecadal to centennial time scales the cosmic radiation variations are mostly due to solar modulation (Fig. 3 C and D) as indicated by the coincidence of cosmic radiation maxima and grand solar (sunspot) minima like the Maunder minimum (Fig. 3D). In fact there were colder AMO periods when the solar wind was stronger in the early to mid 1970’s, mid 1980’s, and early 1990’s. And then the AMO warmed from the mid 1990’s with the weakening of the solar wind. That means that ocean modes are negative feedbacks, AMO and Arctic warming is normal during a solar minimum, and polar amplification is bunk. Some do not know that GCRII changes the chemistry of the atmosphere over the polar circle. This is of great importance for circulation in the winter. This circulation is driven by temperature differences. 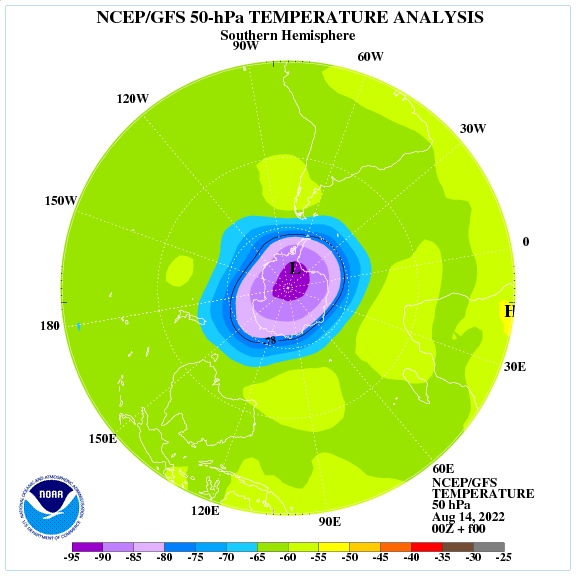 The local increase in ozone and 14CO2 causes anomalies in the same regions due to the Earth’s magnetic field. There are three major problems with greenhouse warming that I’ve pondered for a while without finding satisfactory answers. First, I’ve been unable to find any study in the peer-reviewed literature that uses hard data to confirm the supposed link between CO2 (or other gases) and warming. Even the frequently-cited “landmark” paper by Feldman, et al., 2015, uses theoretical arguments to prove the link. Second, although there appears to have been a clear, 24-year episode of AGW from about 1975 to about 1998 during which there was good correlation between rising atmospheric CO2 and warming, thus appearing to confirm the CO2/warming link, the same can’t be said for the period prior to 1975 and following 1998. Why is it that this convincing correlation doesn’t exist outside this time frame? Finally, according to MODTRAN6, CO2 gas absorbs and emits significantly only within the waveband 13 to 17 microns, with a maximum at 14.95 microns. If this line spectrum were to be sufficiently pressure-broadened to approximate a continuous Planck spectrum, its peak wavelength of 14.95 microns would correspond to a Wien temperature of only -79 degrees C, which is well below normal Earth surface temperatures and also below the minimum temperature of the tropopause (-36 degrees C) due to the lapse rate. By common experience and the second law of thermodynamics, cooler objects (here, CO2) can’t transfer heat to warmer ones (here, Earth’s surface), and their feeble radiation would simply be reflected away. The inescapable conclusion is that CO2 can’t function as a greenhouse gas in Earth’s atmosphere. It is so obvious that it hurts. One observation Andy May makes is that the solar intensity at the orbit of the earth is dependent on the time of year, and varies by +/- 6.5%. That’s (almost) true today, though it isn’t always. The eccentricity of the earth’s orbit changes with time, with a roughly 100,000 year period, from 0 to 0.05. Currently, the eccentricity is 0.01671, which makes the maximum range of solar intensity equal to [(1+0.01671)/(1-0.01671)]^2 = 1.06913, or about 6.4% off from Andy May’s number. However, when the eccentricity is 0.05, the solar intensity varies by [(1+0.05)/(1-0.05)]^2 = 1.2216. In other words, by a whopping 22.16% every 182.5 days, or +/- 151 W/m^2. This happens every 100,000 years, which matches the Quaternary glaciation period. Of course we’re talking Milankovitch cycles, here. There’s much more to be gleaned from the variation of solar intensity versus time due to orbital effects: just the one fact of a current variation of +/- 44 W/m^2 (using Andy’s number) is huge enough. But the peak occurs in January, when the Northern hemisphere is tilted away from the sun. The low occurs in July, when the Southern hemisphere is tilted away from the sun. Since the Northern hemisphere has 68% of the earth’s landmass, it follows that the Southern Hemisphere has 68% of the earth’s ocean surface. These things all make a difference. What’s lacking is any in-depth analysis of what those differences are. I see some trying to find correlations among orbital/solar influence and measured data, and some (fewer) trying to look at the physical implications of same. Both need to be considered.